Elon Musk's SpaceX is sending its Falcon Heavy rocket, the most powerful rocket that's launched from the US since the 1970s, into space on Tuesday. The rocket will include Musk's 2008 Tesla Roadster as a test payload to show how the rocket could one day transport people and goods into space. Musk said he's using the Roadster because it's less "boring" than typical test payloads, but it's also a smart marketing ploy. Elon Musk's SpaceX is sending its Falcon Heavy rocket, the most powerful rocket that's launched from the US since the 1970s, into space on Tuesday. The rocket will take off from NASA's Kennedy Space Center in Florida. A successful launch would be a milestone for SpaceX, as the 230-foot-tall Falcon Heavy is designed to be larger and cheaper than any rockets currently being launched by the company's competitors thanks in part to its reusable boosters. Being able to send large payloads into space at lower prices than competitors would help Musk's ambitions to start colonies on Mars. To demonstrate Falcon Heavy's freight-handling capabilities, Musk is using his 2008 Tesla Roadster as a test payload. On Friday, the Federal Aviation Administration gave SpaceX permission to include the car in the rocket. "Test flights of new rockets usually contain mass simulators in the form of concrete or steel blocks. That seemed extremely boring," Musk wrote in an Instagram post in December. "Of course, anything boring is terrible, especially companies, so we decided to send something unusual, something that made us feel." 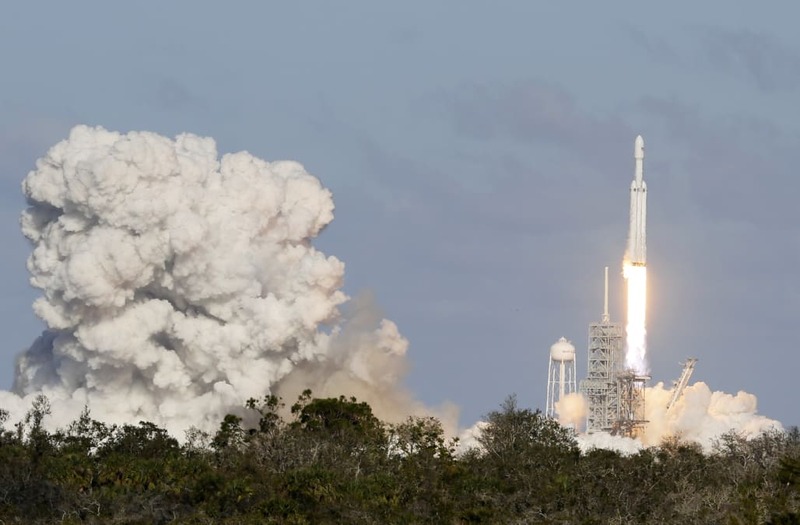 While the inclusion of the Roadster could illustrate how SpaceX could eventually use its rockets to send people and goods into space, it's also a smart marketing ploy from one of the business world's best salesmen, as the Roadster's inclusion in the Falcon Heavy launch has increased the amount of media coverage around the event. According to Musk, the Roadster will play David Bowie's "Space Oddity" on a loop as it cycles between Mars and the sun in a hyperbolic orbit. The Roadster will be manned by a dummy driver Musk has called "Starman." The rocket is scheduled to launch just after 1:30 p.m. ET on Tuesday. You can watch the launch through SpaceX's livestream on its website or YouTube channel.